A computer-generated image of how the new SRC Banbridge Campus will look when complete. Southern Regional College’s plan for a campus new build project in Banbridge has moved a step closer after the Department for the Economy approved funding for the multi-million pound development. 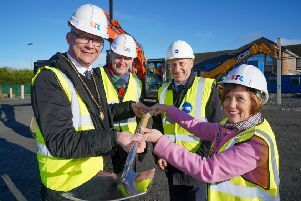 The new campus is due to be developed on the college’s existing site at Castlewellan Road, but the project has been stalled due to the ongoing political stalemate at Stormont. Southern Regional College's Banbridge Campus. “As you will appreciate it this is great day for the future of further education in Banbridge. This announcement will allow us to proceed with the appointment of a contractor, with the new build scheduled to be completed early in the 2020-21 academic year,” Mr Doran added. The funding confirmation has been welcomed by representatives from across the political spectrum. A statement issued by local UUP councillors Alderman Ian Burns, Alderman Elizabeth Ingram and Councillor Glenn Barr said: “The news that the SRC will build a new college in Banbridge with an investment of £12.2 million must be welcomed by all within our community. We as UUP elected representatives commend the governing board of the SRC for their work - in the most difficult political and economic circumstances - in securing monies from the department for this project. The funding announcement has also been welcomed by Upper Bann MLAs Doug Beattie and Dolores Kelly. “This is great news for the future of Further Education in Banbridge, with the project scheduled to be completed early in the 2020-21 academic year. “This project has been ably supported by the dedicated team in Southern Regional College, and I would like to congratulate them on this announcement, which has been achieved through their hard work,” the SDLP woman said. Local Sinn Fein Councillor Kevin Savage added: “This is great news for the Banbridge community and surrounding areas, particularly those young people eager to pursue a more vocational route, adult learners and those who wish to embark upon further education opportunities closer to home. “The new build will become a centre of specialism for digital media and design. A unique feature of this project will be the design centre which will allow students to experience a real work learning environment via industrial design briefs and projects.